I had to go with the alliteration here… but the theme couldn’t be more perfect! 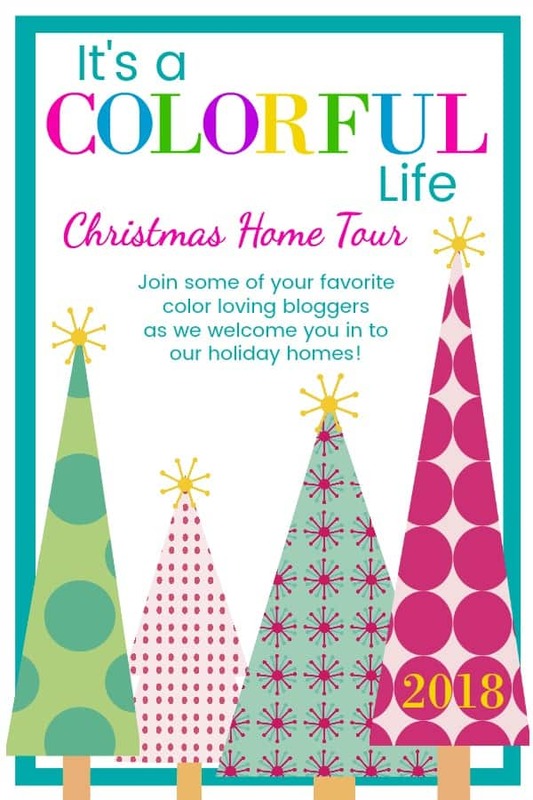 I’m so excited to be joining pals in sharing all of our color-loving Christmas decor with you this week! If you’re coming over from my friend Carmel’s site, then Hi! Any friend of Carmel’s is a friend of mine! I’m Charlotte. I like color. I like Prosecco. I like Dawson’s Creek. And I’m obsessed with mermaid sequins. Every year I look at my Christmas decor and feel a little bit like a lunatic because the rooms don’t necessarily flow together. I’m not sure that I’ve solved the problem this year, but individually I love all these spaces so hopefully you’ll enjoy them one at a time if not all at once! 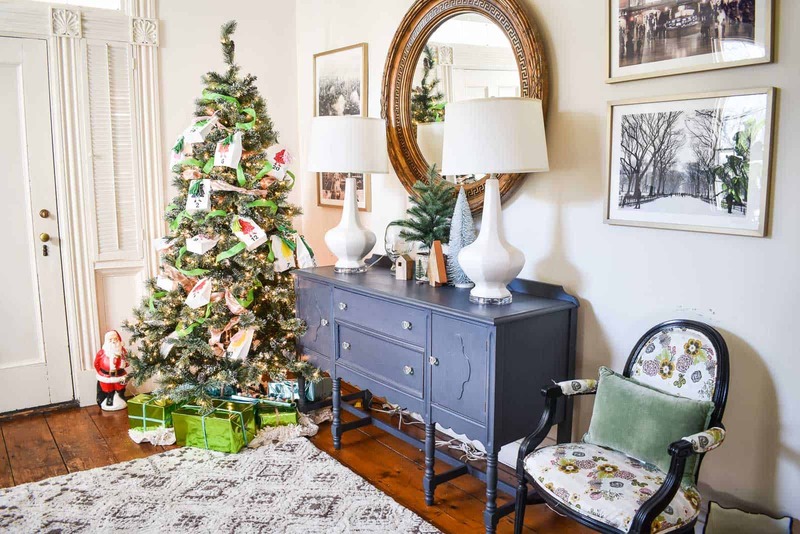 Let’s start in the foyer where I started with my Advent Calendar tree… I’ve been sharing 12 Days of Ornaments on my site and that was Day 2. 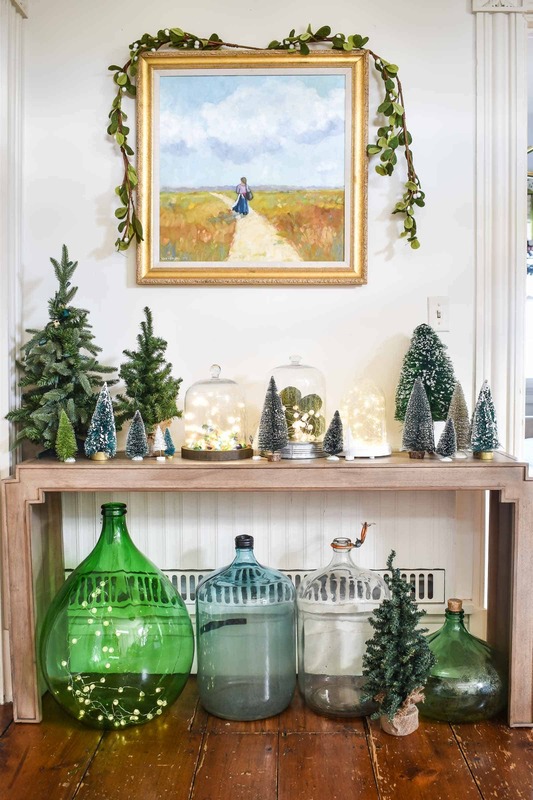 The tree is so busy that I didn’t want to go crazy with other decor, but I couldn’t resist tucking a bunch of bell jars onto that console table with my glass jars and bottle brush trees tucked all around. That painting above was a college graduation gift from my parents and I tucked felt greenery along the top to fill that space a bit. 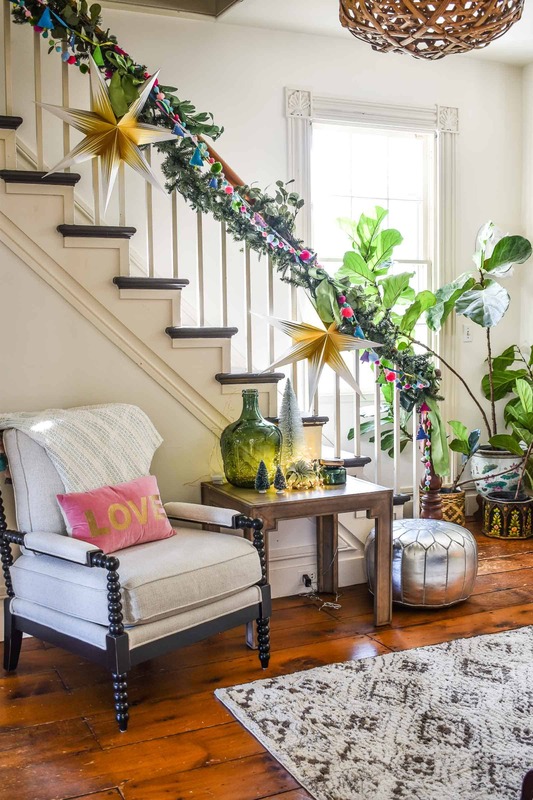 Moving over to the staircase… I decorated it in a similar manner last year and loved the whimsy and color of it so… in the immortal words of Ms. B. Spears: Oops, I did it again. 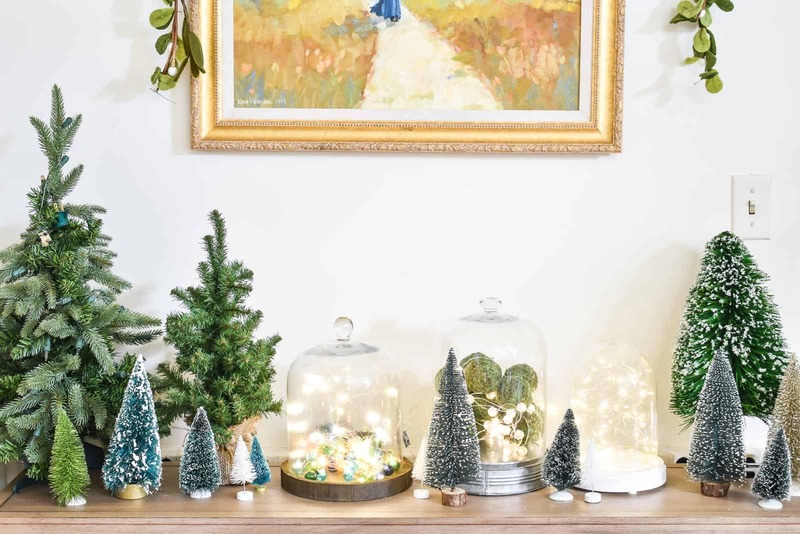 I started with a faux light up garland, then tucked in some faux eucalyptus and then finished with my felt Christmas tree garland, that pom pom garland and then paper stars from Ikea. 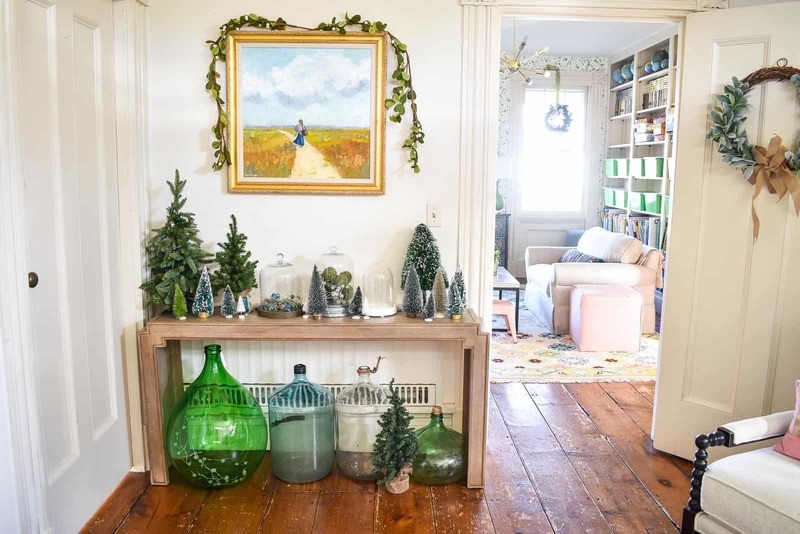 Those lovely string lights are draped around another large green jar and that oversized bottle brush tree on the side table below. Through the foyer is the playroom. I can’t go too crazy in here because… kids. 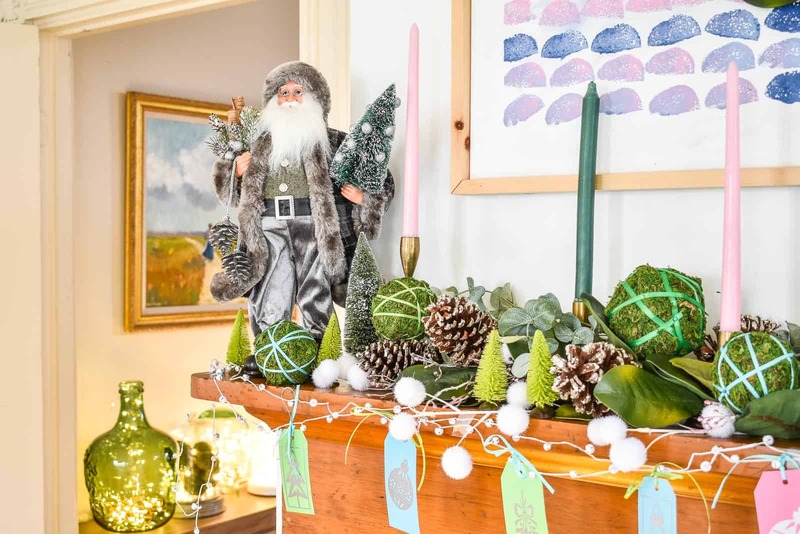 But I hung wreaths over the windows, brought in a few evergreen plants and then a some little decorations on the drawers against the back wall. Last week I shared the tutorial for that cute Christmas cityscape planter so check that out if you’re interested. I made a simple terrarium from a glass jar and then wrapped some micro lights for the vignette. 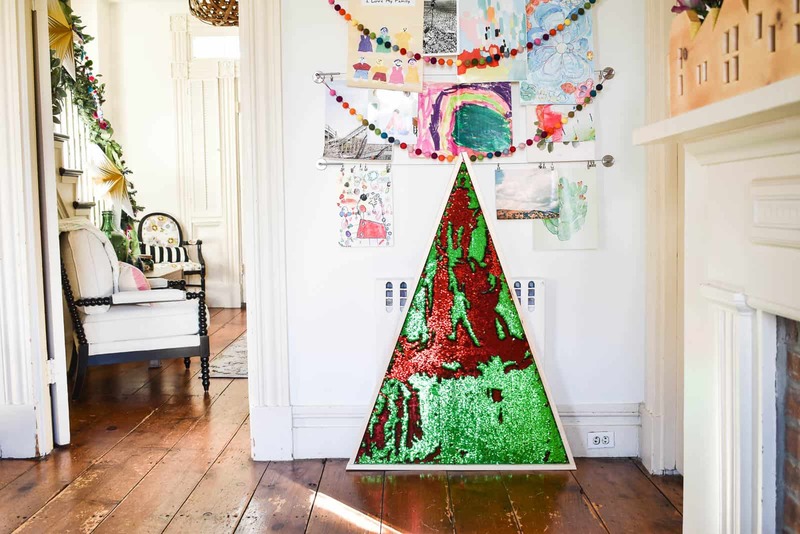 We put up our family tree over the weekend so my superstar mermaid sequin tree moved into the playroom under our art gallery wall. I strung those fun rainbow felt balls to bring in a bit of color. This year, my family is coming for Christmas so we’ll have to squeeze people into the dining room. 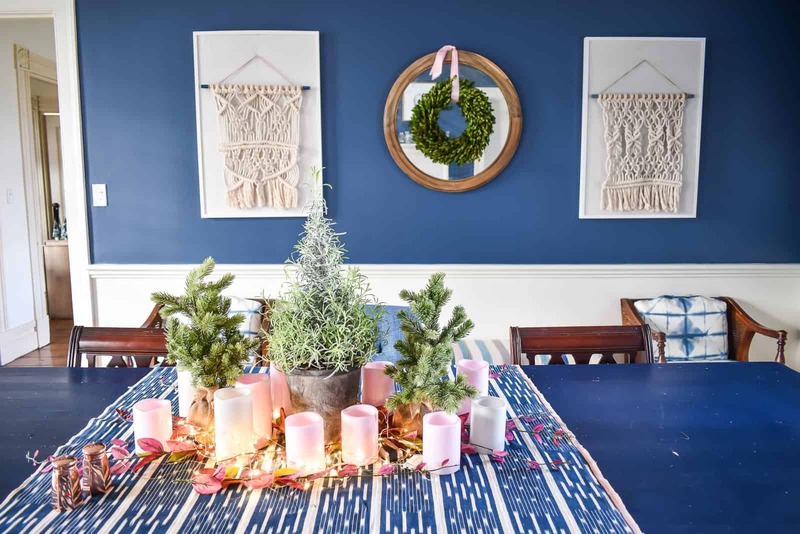 For now, I have a simple little arrangement of faux pine trees and that lavender set up on the dining room table. I draped my favorite indigo cloth across the middle and then brought in some LED lights from Ikea to add a little ambiance. 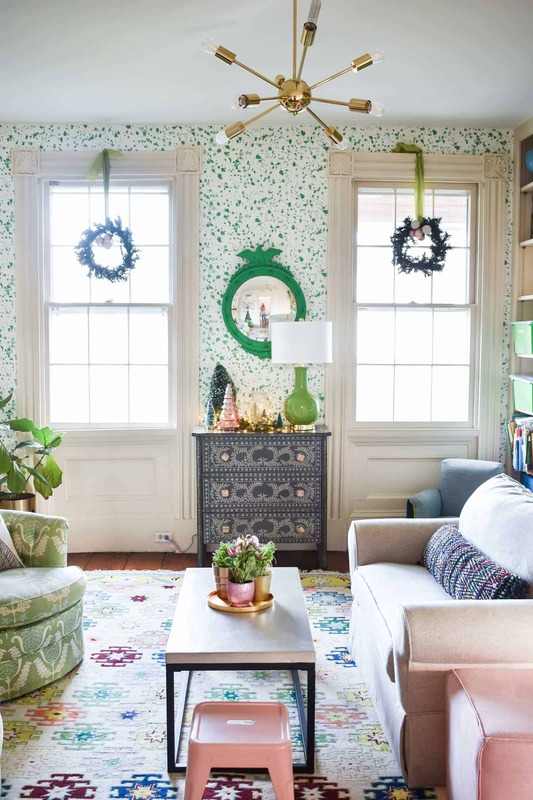 A boxwood wreath over the mirror is the final detail for this room. Our family room gets destroyed on a daily basis by kids climbing on the table, rearranging the couch cushions, etc. so this was another space I didn’t go too crazy in. 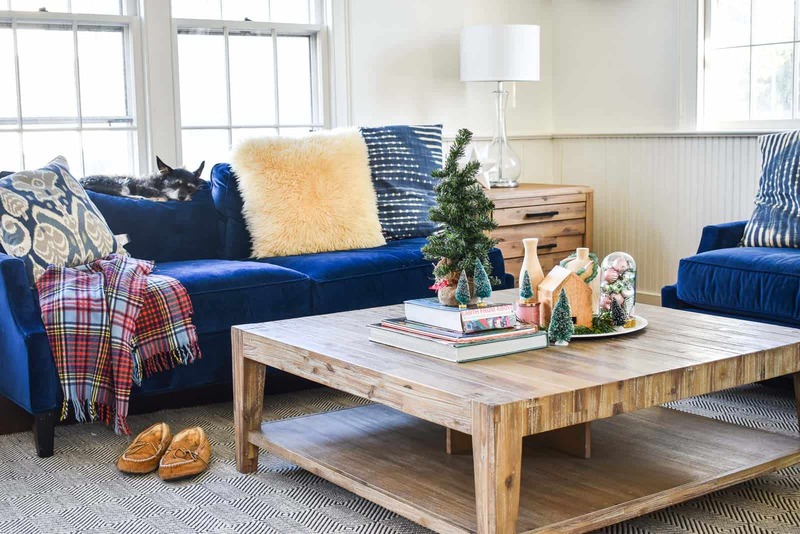 But I did bring out those flea market shearling pillows and added a few Christmas details to the tray in the center of the coffee table. 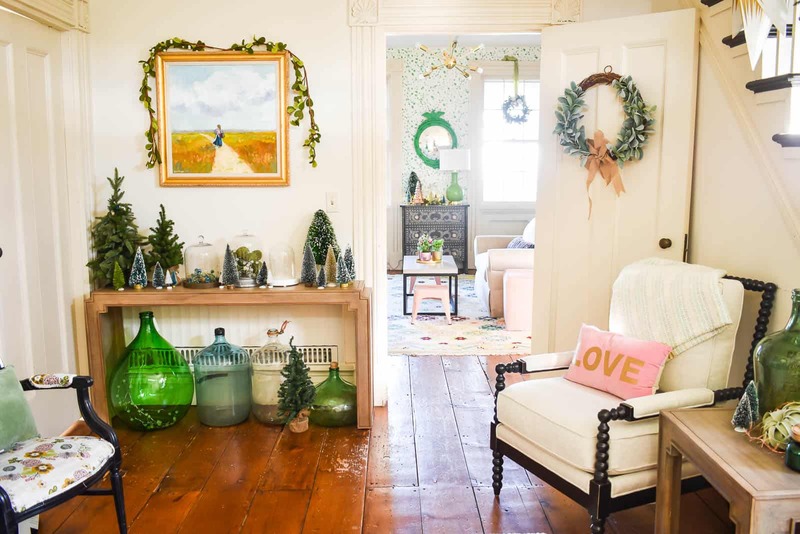 My friends Mallory and Savannah with Classy Clutter have a new decor line where I grabbed those wooden bottles. The sweet little house is from Target but I snagged mine at Goodwill. 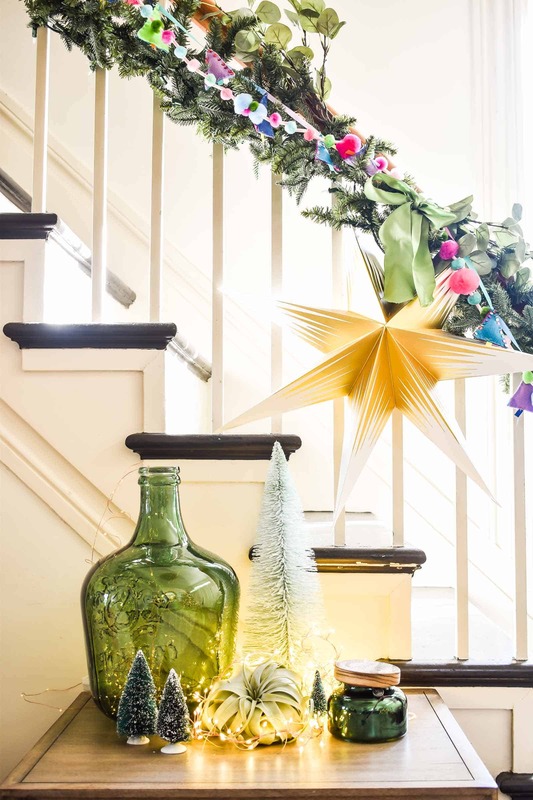 I’ve already shared my Christmas mantel in the living room, but here’s another glimpse of that space. 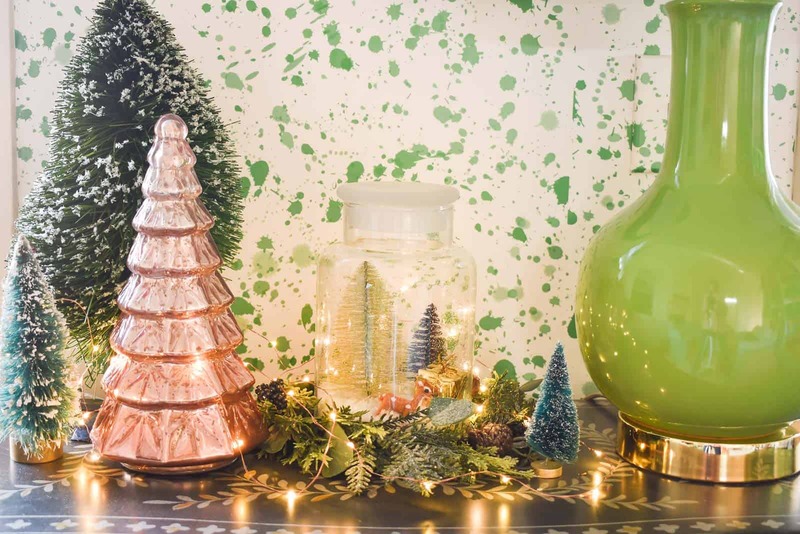 Feel free to click here for more details of the colorful Christmas decor in there. I’m headed outside to add finishing touches to our exterior tomorrow so check back soon for my post about that! 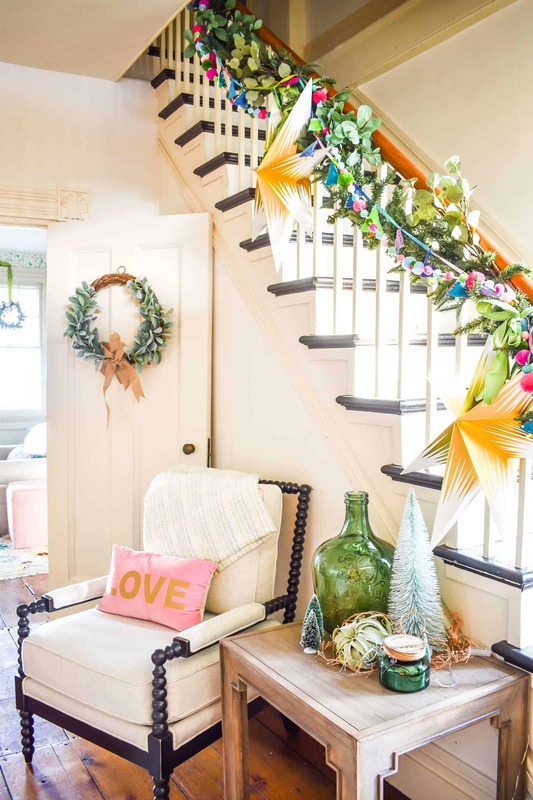 Most importantly, thanks again to Jen from Dimples and Tangles for pulling all my favorite colorful people together to share their decor this week! 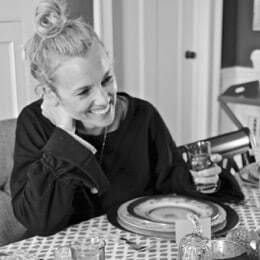 Make sure you head over to Brittany from Addison’s Wonderland next… aside from our color tour, this is a big week for Brittany because her work with Brian Patrick Flynn on the HGTV Dream home in Montana is finally getting revealed- IT’S SO GOOD! 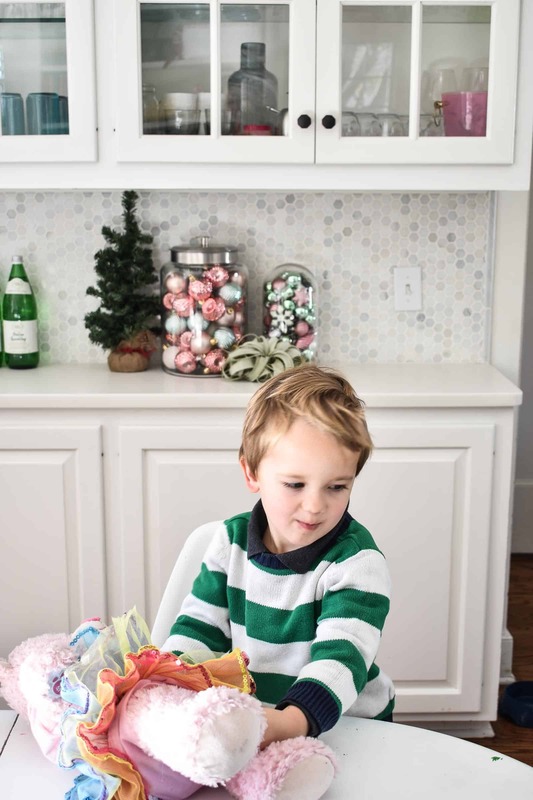 Love all of the bright colors and creative holiday ideas! Great work charlotte! Thanks, Jewel! Can’t wait to go check out the rest of the tour! 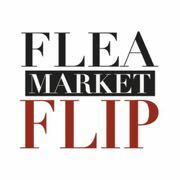 Charlotte, you have no shortage of fabulous ideas for christmas! I could stare all day to take it all in! absolutely love your console and cozy christmas spaces, thanks so much for joining us for the tour! Thanks for organizing this, Jen! I am AMAZED at how bright and colorful and fun everyone’s space has been … can’t wait to go check them all out! This is simply stunning! I love how unique this space is. So wonderful! Thanks Brittany! So excited about your work on the HGTV Dream Home… congrats! Totally in love with your foyer snd living room! 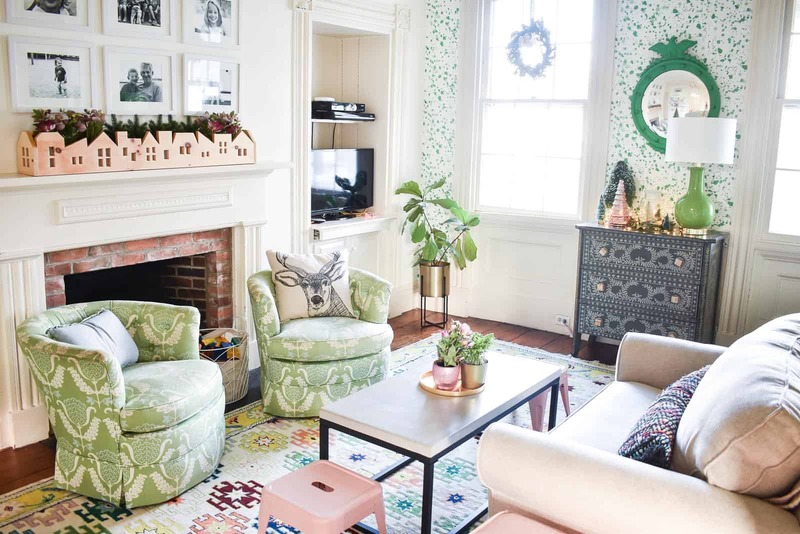 Thosr green chairs are amazing, im also pretty sure i need to start collecting CHRISTMAS trees! Haha! Swear I come up with a new thing to collect everytime I go online! 🙂 THANKS! Omg, that mermaid sequence tree is the best! I too feel like my Christmas decor never flows from one room to another, but its about being festive, right? Love your posts. Also enjoyed the Better Homes and Gardens feature of your home. Thanks, Nancy! Such a pinch me moment!!! 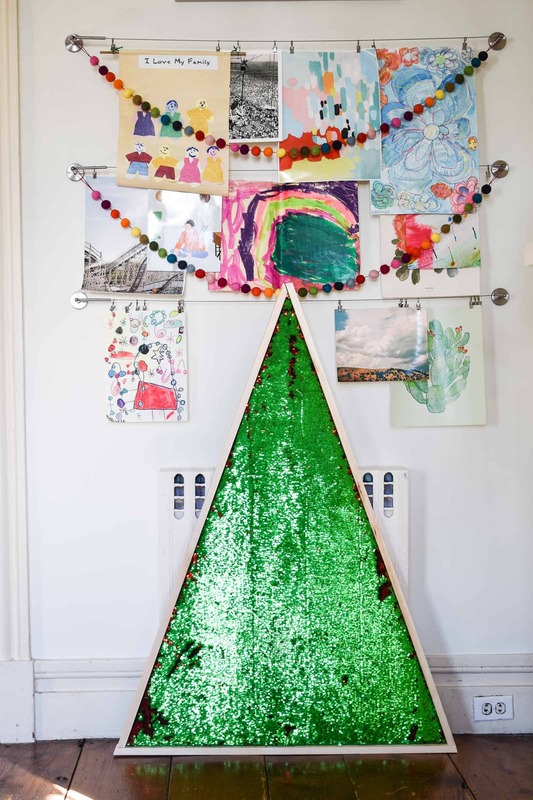 That sequin tree is too much fun!